A North Carolina teacher is the cover star for Time magazine. However, the educator features in a piece on American teachers’ struggles to make ends meet, The News & Observer reports. The cover photo depicts NaShonda Cooke, a teacher at Carroll Magnet Middle School in Wake County. Teacher pay has been on the front-burner in North Carolina politics in recent years, with more than 20,000 educators and advocates swarming Raleigh this spring to protest lagging K-12 funding under the Republican-controlled N.C. General Assembly. 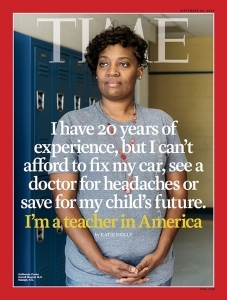 Cooke is on one of three different covers for the Sept. 24 issue of Time that shares the stories of various U.S. teachers talking about how hard it is to make a living. Cooke, 43, a teacher at Carroll Middle School in Raleigh, shares about how despite having 20 years of experience she skips doctor’s appointments to save on the copay and can’t afford to fix her car or save for her children’s future. The Time article comes during a year where teachers around the country held marches, protests and in some cases strikes to protest working conditions. On Wednesday May 16, 2018, the opening day of the legislative session, educators and their supports from across the state traveled to Raleigh to demand more funding for public education. Cooke says she makes about $69,000 a year — which is higher than the $50,861 average salary for a North Carolina teacher estimated by the National Education Association. Cooke says her salary reflects all the extra duties she does at school, her extra pay from being a nationally certified teacher and how she’s grandfathered into a program that used to give extra pay to teachers who have advanced degrees. “Before we judge that she doesn’t make enough, we need to acknowledge that there are millions of families in North Carolina that would love to make $69,000 a year and the benefits she receives,” said Terry Stoops, vice president of research for the John Locke Foundation, a conservative think tank in Raleigh. Cooke said that while she earns more than many teachers, she’s also a single mother who has to use 30 percent of her salary to pay her rent in Raleigh. She also has to pay a variety of other expenses, including student loans and rising health insurance costs. Part of the reason she left the Durham Public School System in 2017 was that the Wake County school system paid more, Cooke said. Cooke worries about saving enough to pay for her 14-year-old daughter’s college education. She also has to deal with the needs of her 11-year-old daughter, who has autism. The Time article also comes as state Republican legislators have trumpeted five consecutive years of teacher pay raises as part of this year’s election campaign. “While there is always more work to be done, the facts speak for themselves — teacher pay has increased dramatically under Republican leadership,” Bill D’Elia, a spokesman for Senate leader Phil Berger, said in a statement. “We thank Ms. Cooke for her service but it’s important that we put this in perspective; when Democrats last controlled the General Assembly, thousands of state-funded teaching positions were eliminated, teachers were furloughed and their pay was frozen. But Cooke said the recent raises still leave teachers making less than what they did before the recession of the late 2000s, when adjusted for inflation. Cooke is getting the national attention after a life of being what she calls an advocate for higher teacher pay and education spending. She spoke last year in Durham as part of “A Day Without A Woman” national protests and urged fellow educators to take part in the May 16 mass teacher protest in Raleigh.